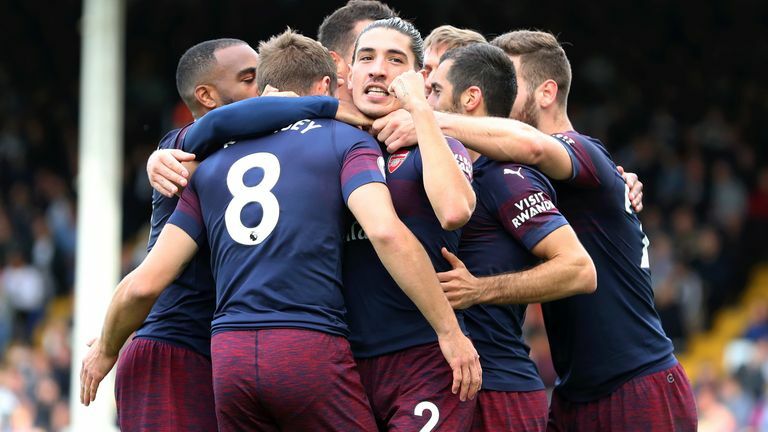 Unai Emery praised Arsenal's "spirit and mentality" after they thrashed Fulham 5-1 on Sunday to record a ninth win in a row in all competitions. Alexandre Lacazette and Pierre-Emerick Aubameyang both netted twice in the win along with a brilliant team goal finished off by Aaron Ramsey. The win saw Arsenal move level on points with Tottenham in the Premier League ahead of the international break. "We are happy but also calm because we know it's difficult each moment and each match," said Gunners head coach Emery. "Today we are happy. We are going to continue in our process with this victory. "I think we need to feel together. With the supporters, the club, the players. This spirit and mentality is very important for us and then we show our quality together and we can be happy like today. "It's a process to know each other better after every training and after every match. We are getting better between the players and with the tactical system." Despite the recent run of results Emery refused to get carried away, saying: "I don't want to look behind me. I think every match is different. In the table, we are little by little giving us a better position for our objective. "When we are winning now and I think we need to be the same way in our mentality - calm, work, enjoy. Enjoy working, feeling together as a team and with our supporters like today. Improving and also finding our best performance in each match. "We spoke yesterday and today before the match. We do not want to stop thinking or winning. The concentration is one thing we need every time. When in training and in the matches, we need to push a lot." While Lacazette and Aubameyang grabbed four of the five goals, summer signing Lucas Torreira impressed for Arsenal. Asked about his display, Emery said: "He is very young. It is his first experience here at this level. He was playing in Italy a hard competition and also he is playing with his national team. Here, I think his process is going very well. "The first is humility to work every day, to listen, to learn. He played today in the middle then right in the 4-4-2 and his performance was the same."